V Punjabi, A Leong. Avulsion fracture of the base of the index metacarpal by extensor carpi radialis longus: A Case Report. The Internet Journal of Orthopedic Surgery. 2007 Volume 9 Number 2. Avulsion fracture of the base of the second metacarpal is an uncommon injury because of the stability of the carpometacarpal joints. We present a case of fracture of the index metacarpal base with avulsion of the extensor carpi radialis longus tendon. All the previous reports have described fall on flexed wrist as mechanism of injury. This case represents the injury as a result of motor vehicle accident (dashboard injury). It was treated with open reduction and internal fixation using a screw and suture anchor. After surgery, the patient regained full function with normal range of movement and power of the wrist. A 47 year old lady was involved in a motor vehicle accident. She was the driver of a car which had a head on collision. She sustained a hyperflexion injury to the left (dominant) wrist which hit the dashboard of the car. She did not sustain any other injuries. She presented to the emergency department with a painful and swollen dorsum of left hand. 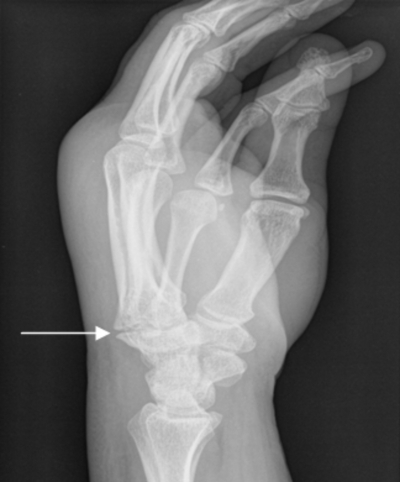 Clinical examination revealed swelling and tenderness over the base of the index metacarpal. Extension of the wrist was very painful and limited. There was no soft tissue swelling in the extensor muscle mass proximally in the forearm. The skin was not breached and the injured hand was neurovascular intact. 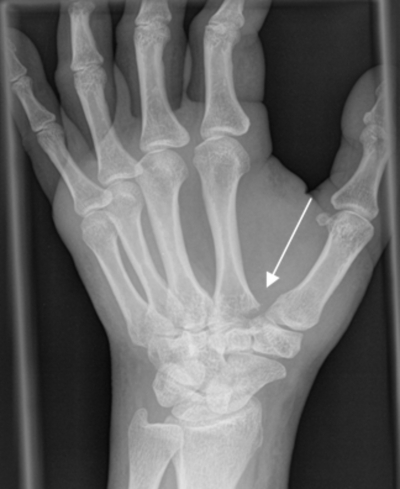 Radiographs revealed an avulsion fracture of the base of the index metacarpal on the radial side (Fig.1). The fracture was comminuted and intra-articular constituting nearly 60% of the joint surface. A CT scan (Fig.2) was performed to define the fracture pattern because of the comminution. A decision was made to perform an open reduction. Under general anaesthetic a dorsal longitudinal skin incision was made centering the base of 2 nd metacarpal. As anticipated there was a small bony fragment which had fractured from the radial side of the index metacarpal base. This fragment had displaced proximally and rotated. There was extensive radial comminution. 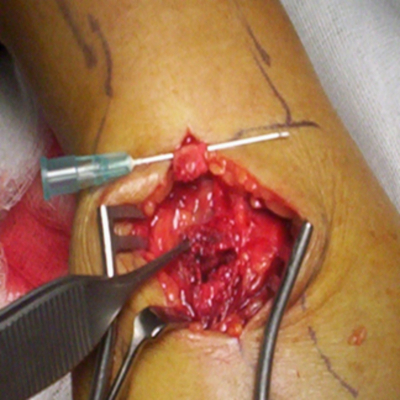 The ECRL tendon was completely avulsed off its insertion (Fig3). It had retracted proximally by approx 2 cms with comminuted bony fragments attached to its stump. This corresponded to the deficit in the base of the index metacarpal on the radial side. The fracture was reduced and the intra articular anatomy restored as best possible given the comminution (Fig.4). This was held with 1 x 1.3mm hand modular set screw. The ECRL tendon was reattached to the dorsum of the base of the index metacarpal using a Mitek suture anchor. Postoperatively the wrist was immobilized in a short arm backslab with the wrist in 30° of extension. The backslab was removed at 2 weeks and replaced with a removable volar wrist splint. Physiotherapy was commenced at 2 weeks. At 4 months post surgery she had full range of movement and normal power of the wrist. 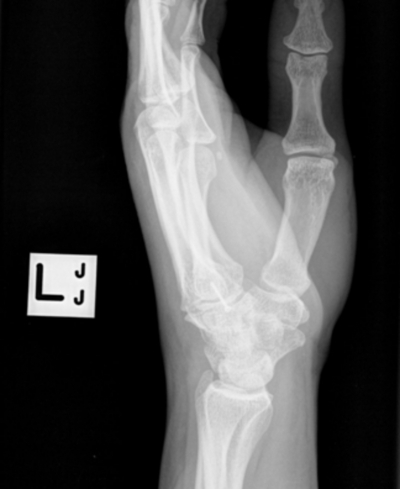 Radiographic evidence demonstrated bony healing at the fracture site. 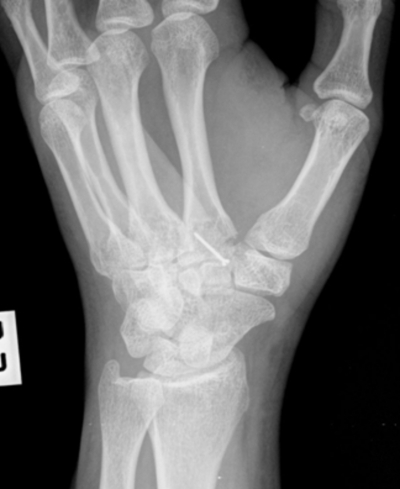 Avulsion fractures involving the radial wrist extensors are rare with only 11 cases 1,2,3,4,5,6,9,10,11 of isolated index metacarpal base fracture with ECRL avulsion reported in the literature. The index metacarpal base articulates with the base of 3 rd metacarpal, capitate, trapezium and trapezoid. The tendon of extensor carpi radialis longus is inserted at the dorsum of the base of the second metacarpal forming a “hood-like” structure over the carpometacarpal articulation. 11 There is a capsuloligamentous complex on both dorsal and volar aspects of the carpus. This complex as well as the bony architecture allows little motion at the index finger and middle finger carpometacarpal articulations and hence injuries in this region are rare. 14 Also, this prevents dorsal dislocation of the second carpometacarpal joint during a forced hyperflexion injury at the wrist. However, simultaneous contraction of the extensor carpi radialis longus results in avulsion of the tendon at its insertion usually with its bony attachment. This correlates with the mechanism of injury in our patient. We decided to treat this injury operatively in order to reattach the insertion of ECRL which is an important wrist stabilizer. The mechanism of injury (wrist hyperflexion and elbow extension) itself is rare. 3 In all previously described cases; fall on a flexed wrist has been the cause of tendon avulsion. This is the first reported case in which the injury is the result of motor vehicle accident (dash board injury). The management of this type of injury has varied in the literature. Open reduction and internal fixation has been advocated by most authors. 1,2,3,6,7,8,9 DeLee 1 reported normal hand function and wrist extensor power after open reduction and internal fixation. Sadr and Lalehzarian 2 reported residual weakness in hand grip and wrist extension after inability to reattach the ECRL at its insertion site 12 days post injury. They advocated earlier intervention with open reduction and internal fixation with anatomic repair of the detached tendon. Crichlow and Hoskinson 4 reported three cases of ECRL avulsions managed nonoperatively, one patient had prominent metacarpal boss which later needed surgical removal while one patient had weak dorsiflexion. Takami et al 6 also advocate surgical intervention with their experience. Boles and Durbin 7 and Vandeputte and De Smet 8 reported cases of ipsilateral avulsions of both extensor carpi radialis longus and extensor carpi radialis brevis treated with open reduction and internal fixation with good results. Treated late, these injuries can result in rupture of the extensor pollicis longus tendon 5,10 due to abrasive action of the avulsed bony fragment. In summary, we recommend open reduction and internal fixation for these injuries with direct tendon repair. This prevents complications of nonoperative treatment like rupture of extensor pollicis longus, metacarpal boss and reduced wrist power and movement. 1. DeLee JC: Avulsion fracture of the base of the second metacarpal by the extensor carpi radialis longus. J Bone Joint Surgery [Am] 1979;61:445-6. 2. Sadr B, Lalehzarian M: Traumatic avulsion of the tendon of extensor carpi radialis longus. J Hand Surg [Am] 1987;12:1035-7. 3. Treble N, Arif A: Avulsion fracture of the index metacarpal. J Hand Surg [Br] 1987,12:38-9. 4. 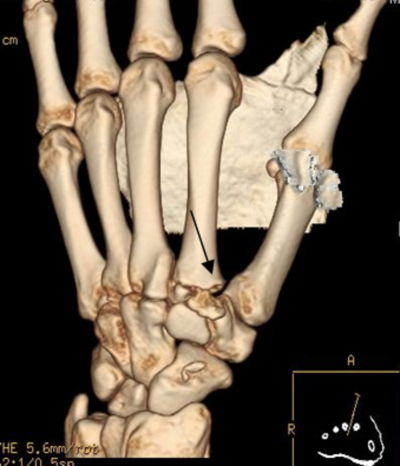 Crichlow TPKR, Hoskinson J. Avulsion fracture of the index metacarpal base: three case reports. J Hand Surg [Br] 1988;13:212-14. 5. Cassell OC, Vidal P. An unreported cause of rupture of the extensor pollicis longus tendon. J Hand Surg [Br] 1996 Oct; 21(5):640-1. 6. 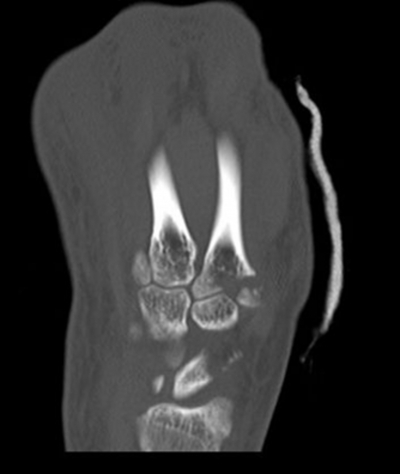 Takami H, Takahashi S, Ando M. Avulsion of the second metacarpal base by the extensor carpi radialis longus. Arch Orthop Trauma Surg 1998;118:109-10. 7. Boles SD, Durbin RA. Simultaneous ipsilateral avulsion of the extensor carpi radialis longus and brevis tendon insertions: Case report and review of the literature. J Hand Surg [Am] 1999;24:845-9. 8. Vandeputte G, De Smet L. Avulsion of both extensor carpi radialis tendons: A case report. J Hand Surg 1999;24A:1286-1288. 9. Jessa KK, Hodge JC. Avulsion fracture of tendon of extensor carpi radialis longus: unknown mechanism. J Emerg Med 1997;15:201-7. 10. Ishida K, Fujioka H, Doi R. Acute rupture of extensor pollicis longus tendon due to avulsed fracture of the second metacarpal base: a case report. J Hand Surg 2006;11(1-2):43-5. 11. Jena D, Giannikas KA, Din R. Avulsion fracture of the extensor carpi radialis longus in a rugby player: a case report. Br. J Sports Med 2001;35;133-135. 12. Johnson AE, Puttler EG. Avulsion of the extensor carpi radialis brevis insertion: A case report and review of the literature. Military Medicine; Feb 2006;171,2:136. 13. Gunther SE: The carpometacarpal joints. Orthop Clin North Am 1984;15:259-77. 14. Kaplan EB: Functional and Surgical Anatomy of the Hand, pp 88-98. Philadelphia, JB Lippincott, 1965. 15. Brand PW, Beach RB, Thompson DE: Relative tension and potential excursion of muscles in the forearm and hand. J Hand Surg [Am] 1981;6:209-19.